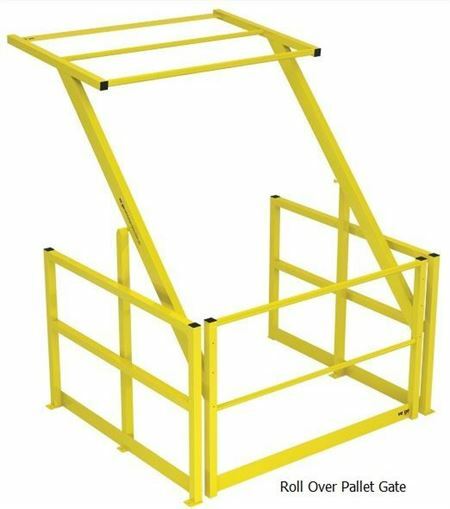 The Roll-Over gate is the perfect solution for providing a high level of protection to your staff whilst also allowing fork truck loading access to raised storage platform/mezzanine floor. They are permanently anchored at the loading edge and providing protection from the fall edge at all times. The gate works on the principle of providing hand, knee and kick rails to either side of the pallet load by simply swinging the evenly balanced gate over the top of the load protecting persons from the fall edge, which eliminates the risk of fall injury. Never leaves an exposed edge as a fall hazard. A Sliding Access Gate is designed to allow fork truck easy access to your raised storage platform or mezzanine floor. The gate easily slides back within itself to allow the placement of a pallet or product on the mezzanine with your fork truck. Storeplan offer several options for handrail systems that can be installed almost anywhere and in all kinds of environments. When applied to the exposed faces on Storeplan raised storage platforms/ mezzanine floors, an OH&S-compliant kick rail is fitted at base plate level. 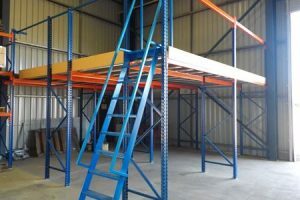 Depending on your individual requirements, you can choose from including standard ball tube, vertical bar rail and rail-and-mesh panel, pallet racking or shelving handrail as per of a rack-supported mezzanine floor. All our handrail systems combine durability and adaptability, enabling use in a wide variety of applications. 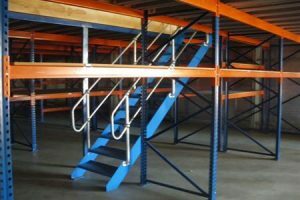 Storeplan raised storage platforms/mezzanine floor staircases are made of steel fabricated stringers with the option of checker plate or grid mesh treads. All external staircases are hot dipped galvanized finish with powder coating as an option. Internal staircases are grit blasted and painted unless you tell us otherwise. The Storeplan project team offers a complete measure, design and installation service for all of your staircase requirements, with one of our trained representative ready to make a free on-site visit at any stage. Safety compliance is vital the design of an access staircase and each Storeplan representative makes sure this is carefully factored into every situation. Storeplan helps you to have easy access to elevated areas such as roof tops, ceiling spaces and maintenance platforms. We offer multiple options including vertical line ladders, caged angle ladders, retractable stanchion ladders, fold down attic type ladders and more. 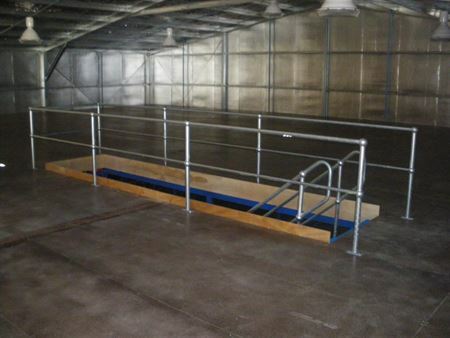 Call 1300 551 281 to discuss your mezzanine floor requirements with our knowledgeable & professional team! A sturdy, versatile and cost-effective storage structure ideally suited to those looking to utilise the full potential of their existing warehouse space. 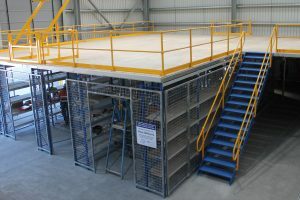 Our LS600 Longspan shelving -supported mezzanine floor or raised storage system is an very popular option for our clients dealing with small parts, automotive spares, electrical components and mining equipment. Storeplan offers a range of quality accessories with all our mezzanine / raised storage floor structures including modular hand railing, access ladders & stairways, sliding or swing pallet access gates and many other customised options – visit our accessories page for more information. 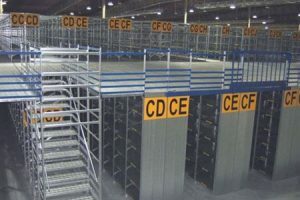 Storeplan’s Raised Storage Platforms / Mezzanine Floor on pallet racking creates additional space using standard racking components designed and engineered for absolute safety and maximum use of space. With our clients’ best interests at heart, we ensure that our structures not only meet all building codes but also meet your exacting requirements. 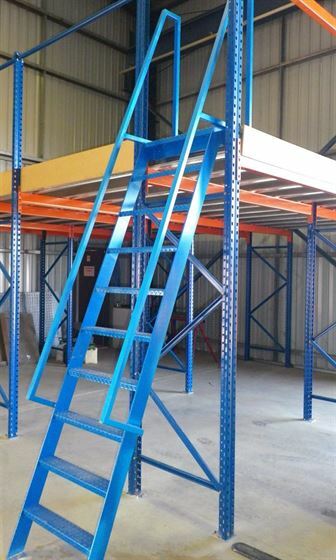 Our racking supported mezzanine floor / raised storage platform can be utilised to include shelving underneath. You can also ask for a configuration where freestanding shelving is installed between the upright frames. 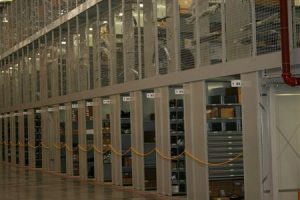 A rack based floor can be easily added to or reconfigured, giving you the flexibility to increase your storage or floor space as your business’ needs change. Aside from storage, you can use the new area as office space, locker rooms, distribution centres and more. 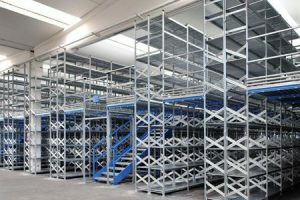 Why use Storeplan’s Pallet Racking Supported Mezzanine? To provide you with the best possible solutions, we take time to understand your business, your current system and what you want to achieve. Our project managers will ensure that the implementation of your storage system is done properly, and complete the project quickly and successfully. For expert storage solutions and personalised customer care, contact Storeplan today. Storeplan’s R3000 is a modular storage system that has the capability to be utilised as not only single level storage but can be set up as a complete multi-tier, complex storage system to save space and optimise storage & space efficiency in your warehouse. The R3000 raised storage platform/mezzanine floor is an open grid mesh system which allows excellent lighting and ventilation. It is complete with its own range of quality accessories such as modular handrails, access stairways, pallet access gates and much more. 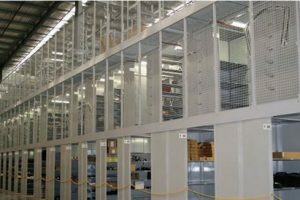 If you’re looking for a strong, sturdy multi-tier structure with high density storage capabilities, then your search is over. 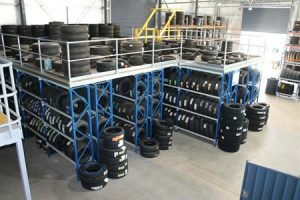 The real beauty of this raised platform system is that it is fully customisable to suit your exact requirements for product storage, weight requirements, adjustability & so much more.